There are few things as sublime as the aroma of tomato sauce simmering on the stove. It makes me think of Sundays, when we’d eat dinner at two o’clock. It makes me a proud Italian. And it always reminds me of my grandmother. I called her Gram, and Gram made the best sauce—for real. 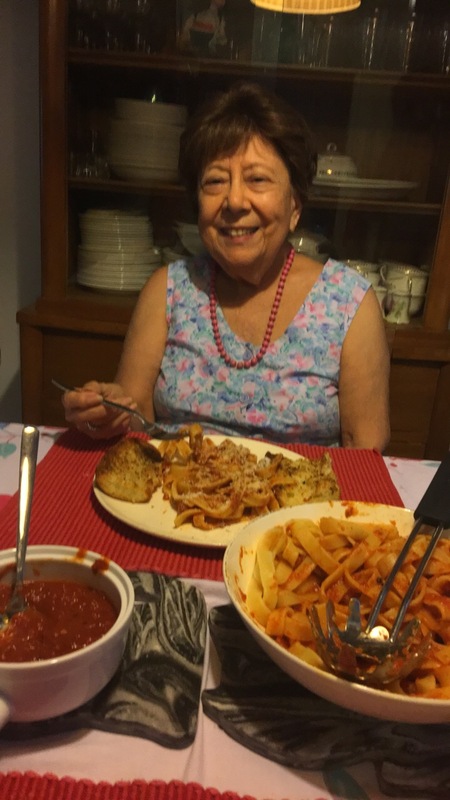 I know every Italian says THEIR grandmother’s sauce is/was THE BEST. Let’s keep this civil, shall we! Sharing Gram’s sauce is something I’ve been wanting to do for a long time. But here’s the tricky part and why it’s taken me so long to post my/Gram’s recipe—I don’t actually have a recipe, per se. Gram never measured anything when she cooked her sauce and neither do I. I eyeball everything. It always comes out perfect though. So, for me to share how I make it, I had to sort of deconstruct it. Mom and I prepped are ingredients by sight, then measured them to come up with something you can follow. Since exact measuring is not really necessary, I did some rounding to come up with quantities you can follow. Once you’ve mastered the sauce, don’t bother with measuring anymore if you want! Good sauce is not just about good ingredients. It is also about the right tools. A heavy bottomed pot is essential because you’re going to be simmering this for a while and you want good heat distribution. Also, steer way clear of pots made with reactive metals, like aluminum, cast iron, and copper. Tomatoes are acidic, and your sauce will pick up a metal taste. I use a 5.5-quart stainless steel dutch oven, but glass and enameled cast iron are good options. I would never cook without my chef’s knife. This sauce involves a lot of chopping, and a 6-inch knife is ideal for job. Use good quality tomato puree and crushed tomatoes. Seriously. Don’t skimp on this. It’s the backbone of your sauce! I like Cento because the ingredients list is one thing—tomatoes. I don’t need spices. I don’t need a basil leaf. I’ll add my own salt. And I don’t want added citric acid (it’s a preservative and color enhancer—yuck.) I like to use one can of puree and one of crushed, for texture. And now this is the secret to Gram’s sauce—bone-in pork rib. Trust me. I’ve made it without the pork rib, all other things the same, and I can tell the difference. I may mix it up from time to time, but I always, always, always start it of with a pork rib. I use a carrot rather than sugar to cut through the acidity of the tomatoes. Not a ton, just enough. I’m not a huge fain, generally, of spice blends. It feels like cheating. But I love Morton & Bassett, either the Italian Herb Blend or Italian Spice Blend. Both are great. If you can’t find them, use your favorite. I also add a smidgen, literally a smidgen, of nutmeg. You don’t taste the nutmeg, and it just rounds the sauce off with an almost earthy note. Heat the olive oil over medium heat. Using a paper towel or clean kitchen towel, pat dry your pork ribs really well. If you don’t, they won’t brown properly. Don’t be tempted to move them around for a few minutes. Let them get a nice brown color. They will release when they’re ready. Brown on all sides, then remove to a plate or bowl. Don’t drain on paper towels. Any juices that drain out of the meat will go back into the pot with the ribs. It’s flavor! Now throw in the onions, carrot, and garlic, stirring occasionally for a 3 – 5 minutes. Two cups may seem like a lot of onion, but we’re making a big pot, suitable for freezing. Hit them with a 1/2 tsp of Kosher salt. I like to season every step, but if you’re worried about sodium or afraid you’ll just make it too salty, go easy. You can always add more salt once the sauce if fully constructed, but you can’t take it out if there’s too much. Once you’ve gotten a little bit of color on your onions, et al and they are good and soft, push them all to the sides of the pot to create a little empty spot. Put your tomato paste into the empty spot, using the edge of a spoon to tamp it down and spread it out a bit. I like using the whole can of paste because it brings a rich, tomatoeyness (yes, that’s a word) to my sauce. Toss your spices, except nutmeg, on top of the paste, and let it all cook a minute or two until the edges of the paste start to look a little orange. You’re also blooming your dry spices. Stir everything together and continue cooking until you get some nice brown bits on the bottom. Brown! Not burned! Lower the heat if you need to. But spread it all out evenly on the bottom of the pot and resist the urge to continually stir it. Stir it occasionally over about 5 to 10 minutes, but always let it sit and do it’s thing a few minutes before you stir again. Don’t walk away from it. You’re are building the base flavor for your sauce, so don’t rush this step. Now you are ready to deglaze. I use white dry wine because it is what I like to drink. But you can use dry red wine. Try it both ways and see which one you like best. Pour in the wine fast and start scraping up the tasty brown bits. That’s wickedly intense flavor. Scrape, scrape, scrape! Until all the brown bits are off the bottom. Any you leave on could burn later on. Let the wine burn off by about half. Don’t walk away from it. Return the ribs and juices to the pot. Pour in your puree and crushed tomatoes. Fill each empty can (including the empty paste can) with fresh, filtered water, and give it all a gentle stir. Italians don’t waste anything, and the dregs in the cans are no different. Pour it into the pot, and stir well. Add the nutmeg. It’s going to be watery, but that’s fine. In a few hours, it’ll be lovely and velvety. Turn the heat up to high and get it to a boil. As soon as it hits the boil, turn it way down to a simmer. If you have a splatter shield (highly recommended) put it over the pot, then put the lid over the shield about three-quarters covered. Simmer, stirring occasionally, and adjusting heat as needed to keep it glub, glub, glubbing, for three hours. Taste it and adjust seasoning, as needed, every time you stir after the first hour. It will taste very raw and blah at first. Don’t worry. And don’t be tempted to add more spice that first hour. You are simmering off that extra water and intensifying the flavor. After about three hours, it will have reduced by about an inch. See below the not done and done photos. It’s ready! The most important thing is to have fun with it! Follow the basics and you’ll be making tomato sauce that would make any Italian grandmother proud.